Still time left to jazz up your summer road trip! 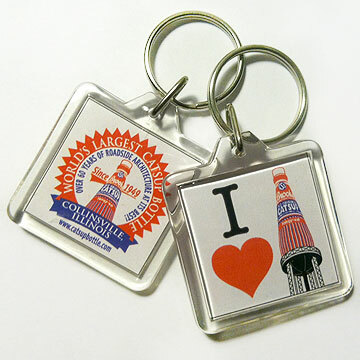 An official Catsup Bottle keychain can do just that! These little goodies are just over 1-1/2" square, clear plastic with a silver key ring. They are double-sided with the "Since 1949" crest logo on one side and the new "I heart the catsup bottle" design on the other. Only $4.00 each on our merchandise page. The highly successful Catsup Bottle Christmas ornament is back by popular demand! We're really excited about this and we're sure you will be, too! The quality of these ornaments is beyond compare. Simply put, they are beautiful. And, we're very proud to say they're 100% made in the U.S.A.! Each red, white and blue, 3-D brass ornament comes in a red, gold-stamped keepsake box with a commemorative information insert card. Official Catsup Bottle red ribbon is also included! The ornament is stamped on the back with the Catsup Bottle website address and "Made in U.S.A." The box measures 5" x 5" and the ornament measures 3.25" x 2.25". Go directly to our merchandise order page or click here for a closer look and more details! 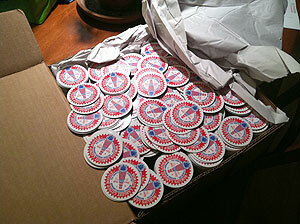 The NEW round refrigerator magnets have arrived just in time for Christmas! The glossy red, white, and blue logo is screen printed to create this beautiful 2-1/8" diameter magnet. You'll be proud to slap this keepsake onto your fridge! $1.50 each. Click here to go to our Merchandise page. And ALSO NEW this year, orders of $5.00 or less pay NO shipping & handling fees. That's right, NO shipping & handling fees... that means it's FREE! 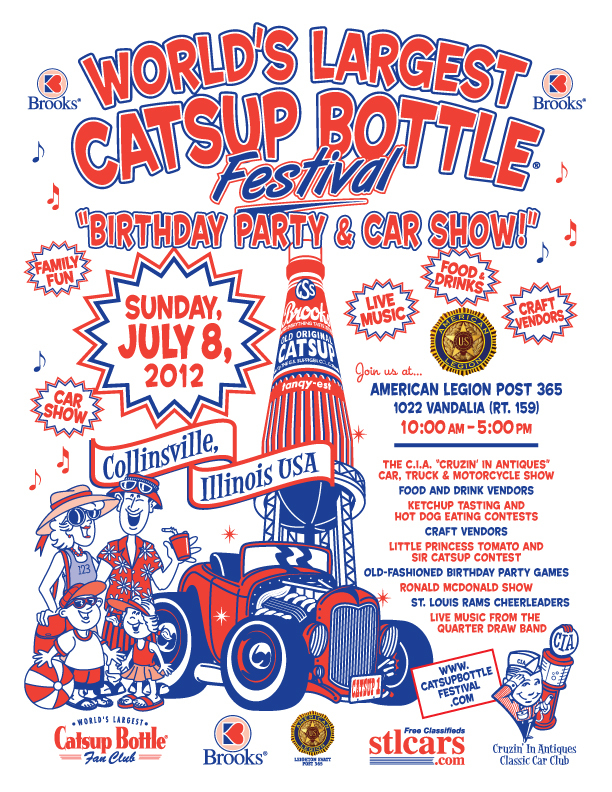 Despite the heat and humidity, the 14th annual World's Largest Catsup Bottle Festival, held on July 8, was a success! For more info, winners results, and a complete photo gallery, click over to the official Catsup Bottle Festival website. We'll see you again next year!